It has rained for 5 days now. Finally the rain subsided and I could smell the lilacs. They were a bit worse for wear in all the rain, but I cut some to bring inside. 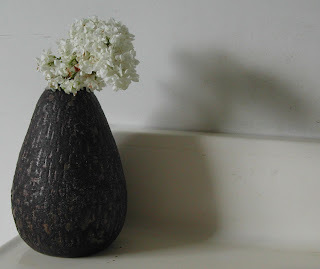 I was looking for a vase and I found a lovely piece made by Harry Lowe. Before he was an acting museum director, before he was a curator, before he transformed Cheekwood from a house to a museum, before teaching, he was a student at Cranbrook. Among his many activities there, he made ceramics. I am lucky enough to own one of his pieces, so the lilacs found a lovely home. I've missed Harry Lowe this week. He is off with the White Ironstone Society looking at soup tureens. So lilacs and Cranbrook vases and even shredded wheat have made think of him. We have so many lilacs around Rochester that sometimes I get a headache from them, the way you would if you were stuck in an elevator next to a woman who'd applied a whole bottle of cologne. I think it's so great that we haven't bred the scent out of them the way roses have lost their scent.